United University Professions (UUP), the union that represents academic and professional faculty across the SUNY campuses, ratified a new six-year contract, according to a press release from Sept. 5. The retroactive contract comes more than two years after the last one expired in July 2016. UUP West Campus Chapter President Kevin Moriarty said in March that infrequent meetings between the union and SUNY top negotiators and the state’s inability to concede on certain measures regarding pay raises had delayed the ratification of a new contract. 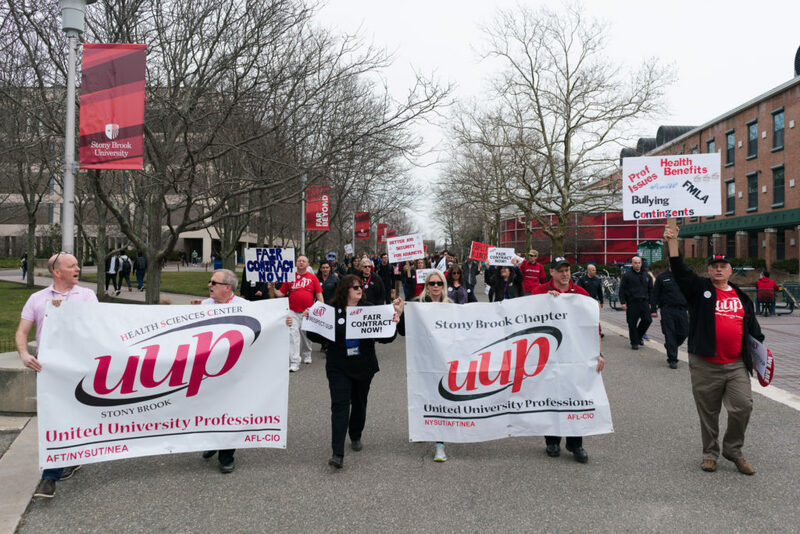 Members of UUP, including Stony Brook chapter members, marched across SUNY campuses to demand a contract in March. The contract was approved by 14,582 members, or 98 percent of the eligible voters that cast ballots, according to the release. Some of the contract terms included a two percent salary increase every year, coverage under New York State’s Paid Family Leave Law and a minimum salary for part-time academics. “At a time when organized labor is under attack like never before in America, UUP members stepped up in record numbers and voted for our new contract,” Kowal said in the release, referring to the Supreme Court’s recent decision which states that unions cannot force non-members to pay an agency fee for the union’s services.